Take a browse through our beautiful resorts in the Maldives and enjoy 3-star privileges that are easy on the pocket. We have a number of resorts to choose from that will more than satisfy your need for tropical island holidaying. Enjoy the beauty and serenity of the Maldives with our stunning range of 4-star holidays. Escape to a water bungalow or beachfront villa and do things the Maldivian way! Destination 2 offers the following resorts and hotels for you to choose from. Swaying palms, glistening aquamarine sea, and fantastic flora and fauna, luxury 5-star resorts deliver pure Maldivian heaven and we have outlined a range of them below. Just select one to suit your needs and prepare for an unforgettable family break. Holidays in the Maldives conjure up images of palm trees, private islands and luxury cabins on stilts, standing just above the calm blue waters of the Indian Ocean. This dream-like holiday destination is ideal for families, friends and couples and is both awe-inspiring and soothing all at once. Rather than being just one island, the Maldives is spread over hundreds of smaller islands, but still caters for over a million visitors every year. Some focus on families, while others and perfect for diving enthusiasts. For those on a relatively small budget, the capital of Malé is a great place to explore a vibrant island city, right in the middle of the tropical Indian Ocean. When visiting the Maldives, most people will be looking for 5-star luxury and in this regard, Maldives luxury holidays are a cut above almost anywhere else in the world. Flights: You can catch a flight from several major UK airports including Birmingham, London Heathrow, Manchester, Newcastle and London Gatwick. Passport/visa requirements: British nationals can get a tourist visa which is valid for 30 days. Your passport must also be valid for a minimum of 6 months.. Packing essentials: Light and breezy summer clothes and beach wear that isn’t too revealing. The Maldives is a Muslim country, so if you are out visiting local islands, try to wear conservative clothing that cover your knees and shoulders (keep a scarf handy to cover long hair). As the world’s most geographically dispersed country, the Maldives is made up of 26 ring-shaped atolls and over 1,000 coral islands. This means that wherever you stay in the Maldives, you will feel as if you’re on your own private island. Malé City is the most populated island, and also roughly in the centre of the collection of tropical islands. It is known as the place for tourists to find the best shopping centres and restaurants, as well as being the island closest to the main airport. The Dive Club, in Malé Island, offers noteworthy activities such as an underwater scooter trip, scuba diving, fishing and island hopping. There are over 100 islands dedicated to tourism in the Maldives with no two islands seeming quite the same. You will find numerous magnificent beaches scattered across the islands including Bikini beach, Coca Island, Veligandu and Hulhumale Island. The Grand Friday Mosque is situated in Manadhoo to the north and is the biggest in the country, attracting tourists and locals alike. Vaadhoo is located close by and is well-known for a natural phenomenon that turns the sea water electric blue. 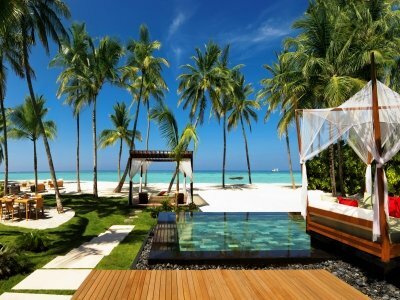 Reethi Beach in the same area is a 27-acre island known for its beautiful resort, dive centre and a world-class spa. There are many more islands situated to the centre of the Maldives islands closer to Malé City, including Ari Atoll, Maafushi, Kuramathi, Meeru Island, Rangali and Rasdhoo to name just a few. Further to the south there a few more islands including Havadhu Atoll, Thinadhoo, Rathafandhoo and Madaveli. The discerning traveller will find plenty to astound them in the Maldives, including underwater nightclubs, fascinating cultural landmarks and plenty of white sandy beaches that really do look too good to be true. 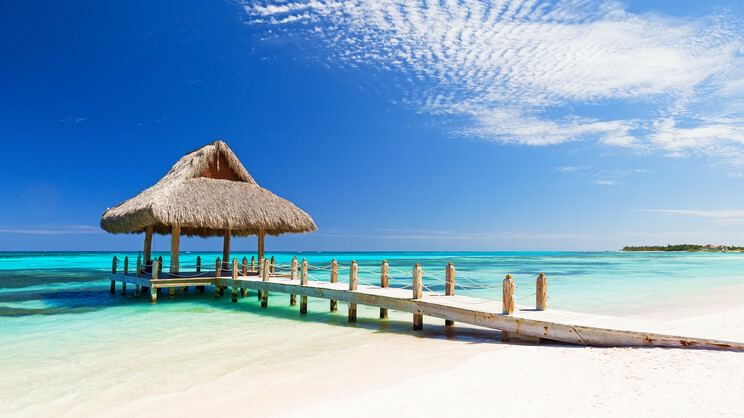 Holidays to the Maldives are almost certainly going to consist of relaxation and indulgence on one of its beautiful resorts. Its beaches are special and time spent relaxing by the coast is an obvious pastime. A trip to Male is a fascinating experience also. The Maldivian capital is definitely the best place to see the local culture and see how local life is on the islands. The capital itself is a fascinating experience. A densely populated city crammed onto one of the small islands. Bright houses and crowded markets abound on this peculiar city stranded in the middle of the ocean. Besides a trip to this intriguing city and lapping up the sun, the islands offer many exciting trips and excursions. Diving in the area is a great experience, with local waters home to some of the most fascinating creatures in the ocean. Diving with hammerhead sharks and whale sharks are a once in a lifetime experience that is not to be missed. Diving is especially brilliant, also, on the southern atoll of Addu, with the spectacular range of colours and variety of wildlife on this coral reef. You could also do some quite extraordinary. Most resorts offer the opportunity to be temporarily stranded on a deserted island – with a lunch provided of course – leaving you to your own devices to explore the white-powder beaches. A very modern castaway. The reputation of the Maldives precedes it as a luxurious collection of islands offering a truly exotic and tranquil experience. The resorts are uniformly fantastic, with exceptional service and each and every island is blessed with fantastic beaches and pristine cyan-blue warm waters, leaving you to relax, sunbathe, dive and swim until your heart’s content. A trip to the exquisite Maldives is an experience that will stay with you a lifetime. For more information on Maldives holidays, call Destination 2 on and speak with one of our friendly and knowledgeable travel experts. Temperatures average between 23ºC and 31ºC all-year round, which is ideal for those wanting to go on holiday outside of peak summer times. The best weather is actually between November and April. Overall the islands have a tropical monsoon climate and two main seasons. The dry season lasts from December to April and has very little rain, while the rainy season lasts from May to November and is wetter with more chance of strong winds. With so many islands to choose from, each with their own stunning characteristics, it can be tough to choose the best beaches in a region known for having so many islands that each resemble a tropical paradise. Lily Beach is well known for having one of the most pristine beaches in the Maldives. The resort also offers plenty of places to eat and is situated near many famous dive sites for those wanting to stay active on holiday. Located on Huvahendhoo in the south of Ari Atoll, Lily Beach is ideal for couples and families looking to kick back and relax during their stay. 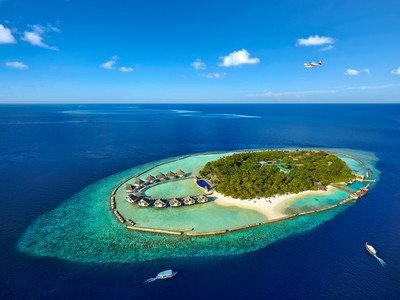 Baros has been said to have the best lagoon in the whole of the Maldives. The beach has everything ticked including soft white sand, crystal clear waters and spectacular views. Once you are done relaxing on the beautifully serene beach, why not visit the Lighthouse restaurant or go reef snorkelling just off the beach. 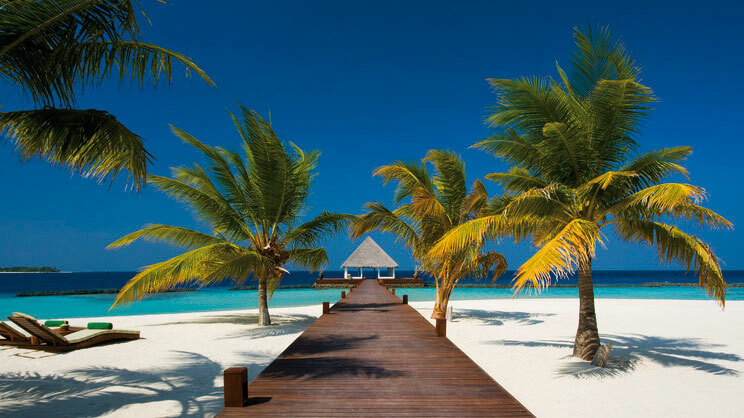 Situated on North-Malé-Atoll, the beach at the Four Seasons Resort Kuda Huraa has been ranked within the top 5 beaches in the Maldives and boasts pure luxury alongside typically stunning surroundings. Why not take a leisurely walk along the beach or join in on one of the daily yoga classes, before eating at the Sunset Lounge or Baarabaru? Last but not least, if you stay at the Dusit Thani Resort or Mirihi Island Resort, you will be in with a good chance of witnessing a superb natural phenomenon where the beaches softly glow in the dark. This wonderful sight has to be seen to be believed, but will truly make your stay in the Maldives one of the most magical and unforgettable holidays you’ve ever been on. Depending on the location of the island you are staying on, you should be able to easily access other islands to partake in numerous activities. You could also head to the most built-up island in your proximity and seek out more adventures. The Maldives has so many opportunities, with water sports, markets, luxury spas and shipwrecks to explore to name just a few. This means that in amongst lounging around in your serene island paradise you can also get active. 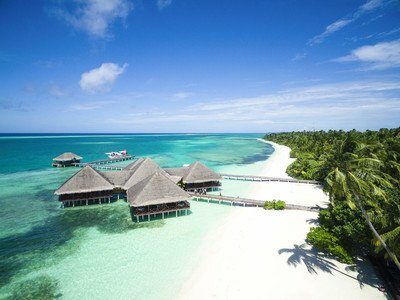 The Maldives boasts some of the best luxury spas in the world, so is the ultimate destination for a relaxation holiday. Chances are, if you’re lucky enough to stay in the Maldives you’re likely to be staying at a hotel that also has spa services included. Popular spa hotels include The Four Seasons at Landaa Giraavaru, Taj Exotica Resort & Spa, W Retreat & Spa and Huvafen Fushi. Malé is one of the best places in the Maldives to book water sports activities or boat tours in the area. It will also help you access other islands more easily through island hopping tours, allowing you to see more and choose your favourite from there. There are also snorkelling safaris available on many islands due to the abundance of reefs and marine life to observe in the area. Common activities available include exploring shipwrecks, snorkelling with turtles and whale sharks, submarine tours, scuba diving, water skiing, banana boating, kite boarding, windsurfing, jet skiing and windsurfing. For something a little more relaxing on the waves, why not try whale or dolphin watching instead? Kurumba and Conrad Rangali are favourites for families looking for a holiday that suits both parents and children, with children's clubs and babysitting services both readily available. The marine biologist at the Conrad Rangali will bring the seabed to life for young explorers. Seeing turtles, octopuses, manta rays, and exotic fish darting in amongst the reef will almost certainly mean that they return home as lifelong marine enthusiasts. If you’re staying near Malé then you will have the pick of the litter if you’re looking to head out to shop. With the Malé local market and Centro Mall on Hulhumale in close proximity on neighbouring islands, you’ll be spoilt for choice. Alternatively, seek out Le Cute in Malé or the STO Trade Centre (also in Malé) for great deals on local produce including tourist mementos, handcrafted items and electronic gadgets.